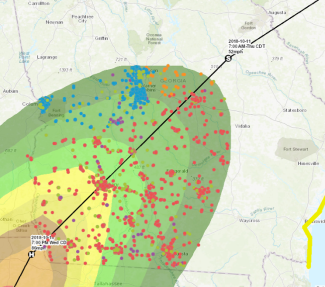 In response to Hurricane Michael, the Georgia Department of Agriculture (GDA) Food Safety Division broadly leveraged new Geographic Information System (GIS) technology for the first time to conduct emergency assessments of food facilities across the State of Georgia. The technology helped inspectors conduct assessments more accurately and efficiently, with results shared in real-time. Previous paper-based forms and manual entry were transformed for the Hurricane Michael response, using a new electronic survey with a data analysis dashboard platform (Fig. 1). To enhance the GDA’s ability to quickly and effectively conduct emergency assessments, inspectors collected data through a custom survey that captured the level of damage to Georgia’s food facilities. This included a review of each firm’s status of electricity, potable water, sewage system, food handling and preparation areas, and lost food product due to physical damage, loss of power, flooding, etc. The survey also actively tracked whether a food inspector took any regulatory action, such as witnessing a firm’s destruction of product, or rejecting equipment (for example, a refrigerator no longer working due to power loss). Days after Hurricane Michael came through Georgia, the GDA’s Food and Feed Rapid Response Team (RRT) completed more than 1,400 assessments. Inspectors reached out to food processors, manufacturers, dairy farms, warehouses, distributors, and retail grocery and convenience stores by phone and in-person visits. The results helped determine the impact to Georgia’s food and agriculture sector, as well as outline a path to recovery. GIS technology from Esri (www.esri.com) is the platform the GDA is using. 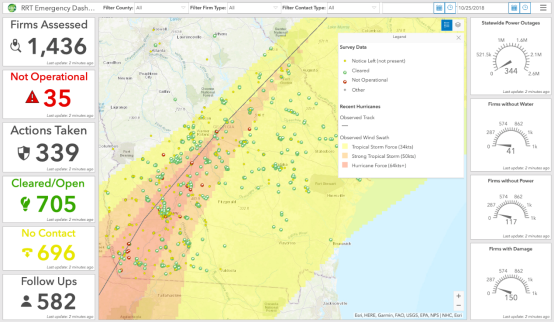 Georgia’s custom-survey was created using Survey123 for ArcGIS, a configurable “consumer off-the-shelf” (or COTS) application that is part of the Esri platform. Earlier in 2018, the GDA began working with Esri and their team deemed the Survey123 for ArcGIS mobile application to be the best fit for the RRT’s needs, as it can be easily configured and edited any time. The technology allows GDA inspectors to complete the survey from their mobile device or computer, with or without internet, either by phone or on-site at a food facility. The GIS not only captures survey responses, it also tracks progress in near real time on an electronic dashboard, with an interactive mapping tool and the ability to easily share and analyze gathered data. “We saw the Rapid Response Team Pilot as an opportunity to provide tech transfer for the Department, so their staff could configure the tool for best use,” said Robert Rike, the GDA’s Esri Account Executive. To learn more Esri’s technology and the ArcGIS platform, click here (www.esri.com/en-us/arcgis/about-arcgis/overview). For those impacted by the storm wishing to report significant food facility damage to the GDA, please call 404-656-3621. For non-emergent issues, please contact 404-656-3627. For the latest information about the GDA’s response and recovery efforts after Hurricane Michael, visit the GDA’s Hurricane Website(http://agr.georgia.gov/gda-hurricane-response.aspx). Stay informed with continuous updates by following the GDA’s food safety program on Twitter, www.twitter.com/gdafoodsafety. Fig. 1: Screenshot of the GDA’s Survey123 dashboard, with real-time updates as data is inputted by inspectors as they complete assessments. Data shown here summarizes the GDA’s food safety response specifically for Hurricane Michael. Fig. 2: Anticipated wind projections for Southwest Georgia on Wednesday evening, Oct. 10, with potentially impacted food facilities regulated by the GDA represented by different colored dots on the map. Fig. 3: Blue dots represent food processors and manufacturers in Georgia that were in the pathway for hurricane and tropical storm force winds as Michael moved across the state.